Crestwood Village 4 is a 55+ community in Whiting, New Jersey. The community's convenient location in Ocean County offers fine dining, upscale shopping and historic attractions. 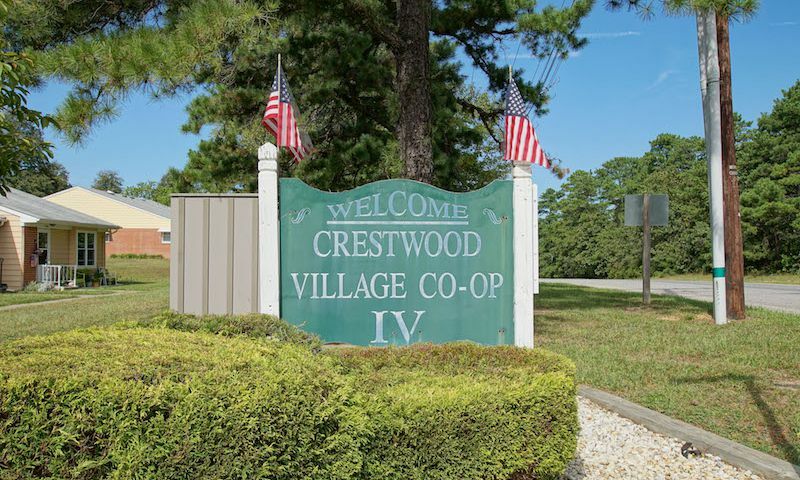 Residents of Crestwood Village 4 enjoy living in a quiet environment that has plenty of amenities. Crestwood Village 4 offers homebuyers low-maintenance co-op homes that are ideal for active adults. This carefree environment gives residents more time to participate in clubs and activities in the community's exclusive clubhouse. Crestwood Village 4 offers wonderful amenities that cater to the social and physical needs of active adults. The community clubhouse, Independence Hall, is the central hub for exciting events and activities at Crestwood Village 4. Independence Hall has a multi-purpose room, card room and billiards. Outside, residents can challenge friends to a game on the bocce and shuffleboard courts. Crestwood Village 4 is comprised of 1,190 co-op homes. Co-op homes are not allowed to be financed so homes have to be bought with cash. There are many different styles and sizes for buyers to choose from. Homes typically range from 537 to over 1,800 square feet and have one to two bedrooms and one to two bathrooms. Some homes have an attached one-car garage while others offer an assigned parking spot. Crestwood Village 4 welcomes residents that are aged 55 and better. Homeowners have more time to enjoy activities and events because the homeowners association takes care of snow removal, exterior building maintenance, landscaping throughout the community, and access to the exclusive community clubhouse. Stress-free living is the atmosphere at Crestwood Village 4 whether you are socially or athletically minded. There are many social groups and exciting events that are constantly being planned with new friends and neighbors. Residents enjoy activities such as bingo, dances, Mah Jongg, cards and traveling throughout the surrounding area. Crestwood Village 4 is located in Whiting, New Jersey. This ideal location in Ocean County is near many stores, restaurants, medical facilities and daily conveniences. This beautiful area is also situated near the Garden State Parkway and Interstate 195, providing easy access to major conveniences and attractions in every direction. Popular destinations include Atlantic City, New York City and Philadelphia. Crestwood Village 4 is the perfect active adult community for those wanting to live in Southern New Jersey. There are plenty of activities available in Crestwood Village 4. Here is a sample of some of the clubs, activities and classes offered here. Crestwood Village 4 is comprised of 1,190 co-op homes. There are many different styles and sizes for buyers to choose from. Homes typically range from 537 to over 1,800 square feet and have one to two bedrooms and one to two bathrooms. Some homes have an attached one-car garage while others offer an assigned parking spot. In regards to the letter below. I had the same experience with the older lady on the board of trustees as far as being rude. I felt like she didn't like me because I didn't understand a question and the look I got from her was quit disturbing. I decided to purchase my forever home in a different community. On 12-5-17 I went into the clubhouse and to the office to inquire about a unit that is for sale. The younger women was nice enough but the older women who was the source of the information was almost to the point of rude. It didn't seem that they had any way to pull up the information I needed. I asked questions when was the last roof put on ? crawl space done, insulation. Had there ever been any water damage to the property? She said that wasn't my problem as the possible buyer but they take care of it. I think any potential buyer would want the answers to their questions. I asked who decides what and when things do get done..she said it was based on condition and need. The roofs in this community look like they are in need ...the siding she said would never be replaced because it will last forever..they just touch up the paint..I was very disappointed with how I was treated and that this community seemed to be very unorganized and didn't seem to have the ability to maintain their community! I have a serious allergy to MOLD and I need to know to know about the condition of my environment. I think most of us 55 and over would like to feel confident that where they live will be maintained properly and records kept so that a person possible moving in can make an educate decision. Not given the answers we JUST DO it? Very SAD over 55 possible buyer! 55places.com is not affiliated with the developer(s) or homeowners association of Crestwood Village 4. The information you submit is distributed to a 55places.com Partner Agent, who is a licensed real estate agent. The information regarding Crestwood Village 4 has not been verified or approved by the developer or homeowners association. Please verify all information prior to purchasing. 55places.com is not responsible for any errors regarding the information displayed on this website.